Taking place in a constructed living space, this durational piece will be interactive through email, phone, two-way microphone and a projected computer monitor. By choice Skeena will try to live a normal life in the space 'behind glass'. The project is inspired in part by Minik, an Inuit (Eskimo) boy who lived with five others on display at the American Museum of Natural History in 1897. During the performance the artist will invite the public to engage her through various media while she remains enclosed. Although the public has access to her she will be able to control when their messages are accepted and how they are responded to. 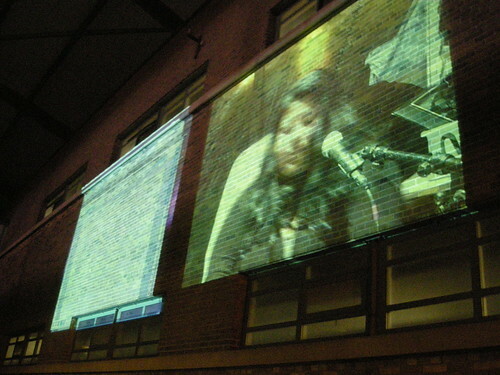 Some of the communiqué will be projected or amplified for everyone to hear and see. This will be an intensive night of access and information sharing. Please Do Not Disturb is a social experiment exploring the history of Indians on display, as public spectacle, freak shows and now today on Facebook. Skeena Reece (Vancouver, BC) is Tsimshian Cree, a working artist, and administrator since 1996. Her multi-disciplinary practice includes: performance art, spoken word, humour, “sacred clowning”, writing, singing, songwriting, video art, and arts administration. Skeena was past Director of the Indigenous Media Arts; organizer of the 8th Annual IMAGeNation Aboriginal Film and Video Festival; and Founder and Artistic Director of the Native Youth Artists Collective (Vancouver) for two years.